Every plant lover loves Monstera deliciosa aka Cheese plant. Their huge ‘lush green, glossy, perforated leaves gives a tropical feel to any room. The cheese plant, can grow very large in the right conditions, up to 20ft. 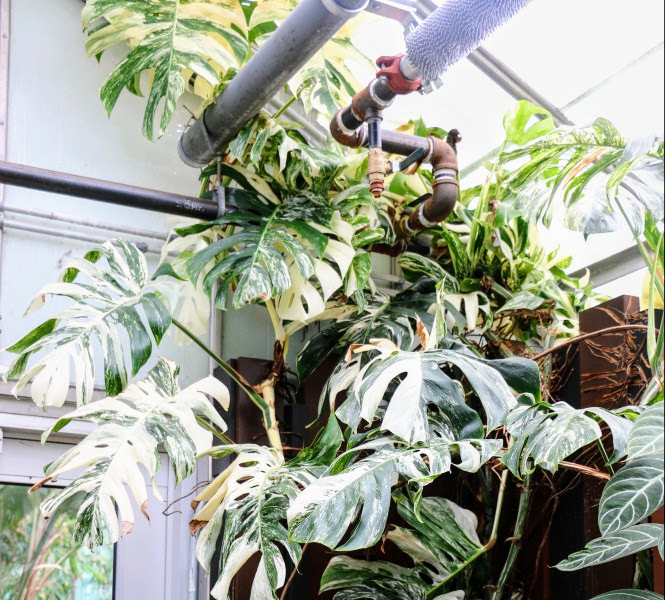 Monstera deliciosa variegata climbing up wood supports and exposed pipes. In its natural habitat it ‘climbs’ up tree trunks and branches for support by way of its leathery aerial roots. 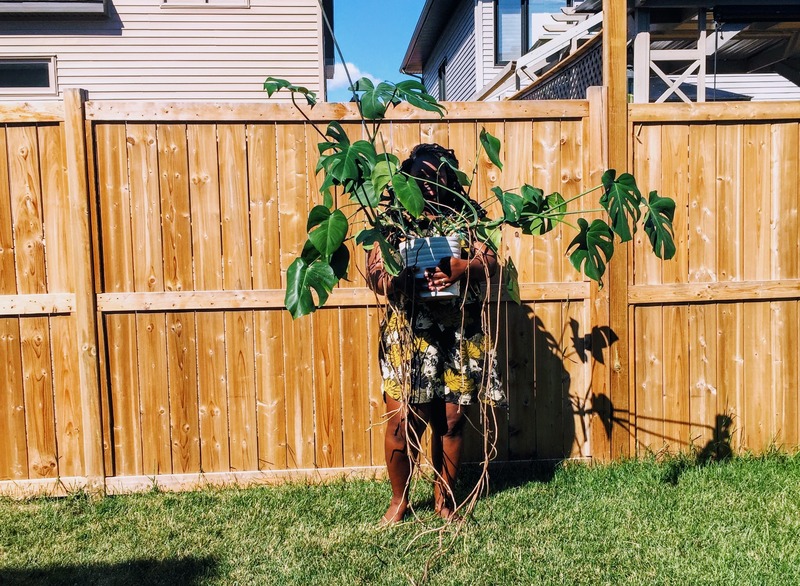 These aerial roots not only provide a strong anchor but also takes up nutrients and water from the environment. The perforated leaves have been said to help the cheese plant withstand strong winds. Young leaves may be unperforated but as the they mature they develop the split leaf pattern that we all love. Besides the beautiful lush leaves, the other thing outstanding about this plant are the aerial roots. As an indoor plant these aerial roots can be left as is, trailing on the floor, pushed into the soil, or attached to a stake. Attaching the aerial roots and stem to a pole for support not only allows the plant to climb but also adds to the health of the plant as its native habitat conditions are provided. I tried using small bamboo poles to ‘lift’ my Monstera, 2 years ago. 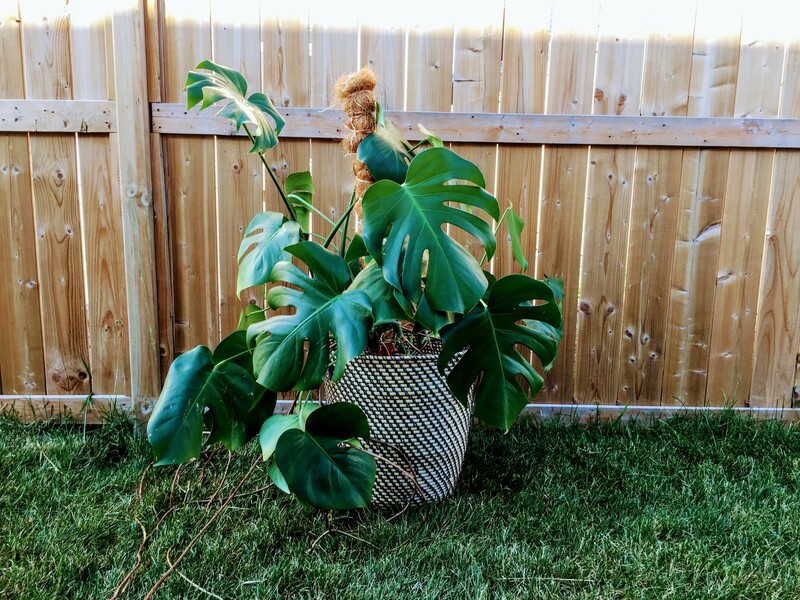 Now it has grown so big, the support poles no longer can hold the weight so it was time to train my monstera (repot and properly stake.) As an indoor plant you have to train it regularly to climb whatever support you provide. Providing support for monstera can be done in a number of ways. You can buy support poles online or your local local garden store (couldn’t find any). You can also attempt to make one – which is what I did. In providing support for the plant whatever you plan to attach it to should have properties that mimics a tree trunk. The popular support are moss poles. I ended up using coir instead as I couldn’t find bulk sphagnum moss to buy and using those small packaged ones would have cost too much to cover the poles. 1.Bamboo sticks from dollar store. You can also using PVC pipes if available to you. The advantage of using a PVC pipe is that it will not rot. Also the best time to stake the plant Is at repotting, as it is difficult to push the poles into soil filled with plant roots. I used 2 bamboo sticks. 2. Coir. I searched everywhere for loose coir for sale – no luck. I ended up getting some coir lying around at a nursery for free. I also bought coir liners in the hopes of using them to wrap around the stakes. The loose coir though ended up being exactly the right amount so I didn’t use the liners. Very simple – Cut the coir and wrap it around the stick using twine or whatever strong string you have on hand. Thats it. Make sure to leave the part of the stake that will be in the soil bare (Like in the picture below). Place the stake in the new pot and place soil around it to keep the stake straight. Then place the plant in the new pot and gently attach the stem to the stake wherever possible. 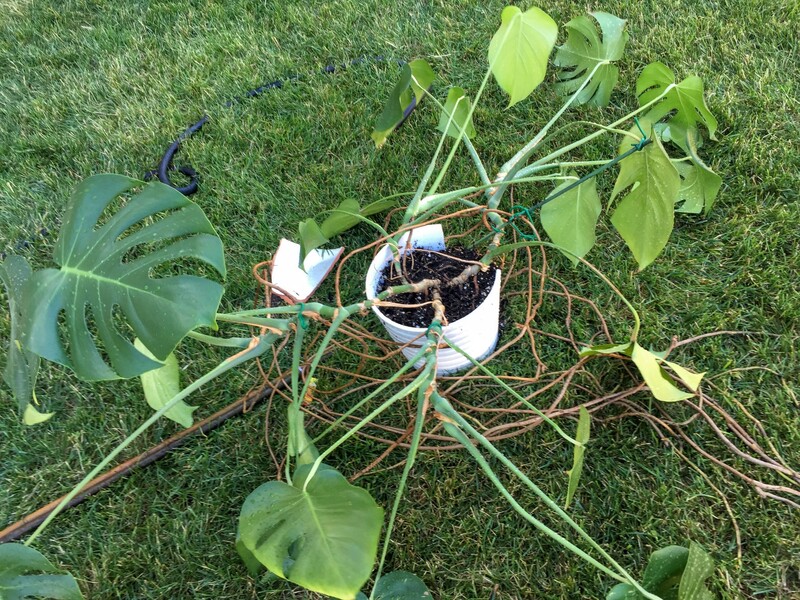 You have to be careful when removing the monstera plant from its old pot to the new one. I injured a few leaf stalks throughout this whole repotting process. This is because I had difficulty removing the plant root from the pot. I would suggest potting the plant in a plastic pot before putting in a decorative pot. That way if you need to repot in future it would be much easier to remove. Voila! All done. I cut the aerial roots a little short and pushed some into the soil. Some I tried to wrap around the stake and the rest I just left hanging out. Mist the coir regularly (as it dries out faster than moss). This will encourage the aerial roots to attach to the coir promoting vertical growth. Monstera can be grown in light shade, or in bright filtered light. Keep out of direct sunlight except perhaps in winter (with caution). Water when the top third of soil dries out. And remember- repotting Monstera means a huge monstera, so if you don’t have the space, limit the frequency of re-potting. My monster-a now seem to be well contained now and isn’t taking up too much horizontal space. Feel free to share any Monstera staking tips you might have below. Hey I’m just curious, I have a monstera thay I was thinking of staking soon, but I was hoping for mine to be more bushy. It looks like you have three separate vines growing from the pot! Was it this way when you bought it or did other vines emerge from the soil later? I was thinking of maybe propagating a cutting back into the same pot to achieve a similar look when I report it for the first time. What do you think? I repotted a Monstera about 4 weeks ago that was left behind from a previous tenant. It’s not very big, two split leaves, two non split leaves, and a tiny unfurling leaf that is taking a really long time. When I repotted I had to make the drainage holes myself in the new pot. Now I think I made a mistake and the pot may be too big for the size of the plant, and it’s not draining as well as I hoped. Should I repot it now to a smaller pot with better drainage, or just water it less frequently? I gave my daughter a cut leaf from my Monstera because while in water it grew roots. She potted it up and now has three new leaves BUT the air roots are growing up out of the soil! Why is this happening and what should she do? Note: My plant, called Biggie, has lived with me for 52 years! From what I understand aerial roots usually grow from the stem above the soil. If there are roots growing up out of the soil into the air, maybe too much of the stem was buried I the soil during replanting hence the aerial roots with it. Perhaps they are growing up and out as nature intended. I hope I answered your question. Leave the roots and see what happens. They usually tend to grow and fall on the ground if they have nothing to hold on to. But you are the expert here though! You’ve had biggie for 52 years, so really I should be asking you for advice . All the best. Great monstera you have! I recently bought a rather large one and had to squeeze it in my car to get it home and a few of the leaves have been damaged in transit. Would you advise removing damaged leaves/ any crispy brown parts that are present? For aesthetic reasons, sure you could remove damaged leaves. Thanks for the really informative post! I just bought a large secondhand monstera which I think must be quite old, but its owner hasn’t trained it too well. I think I need to repot as it is growing outwards, and the current plant pot has no drainage holes. It has a short stake in the pot that only reaches about 1/3 of the way up the plant. I notice your pot doesn’t seem to have any drainage. Would you recommend this? If the plant has lived without drainage up until now do you think it would be a bad idea to change this? I’m just worried as I recently killed a zizi plant through overwatering – I no longer trust myself! Drainage holes are always a good thing. Especially if you tend to over water. I’m careful when watering plants not in drainage pots however. 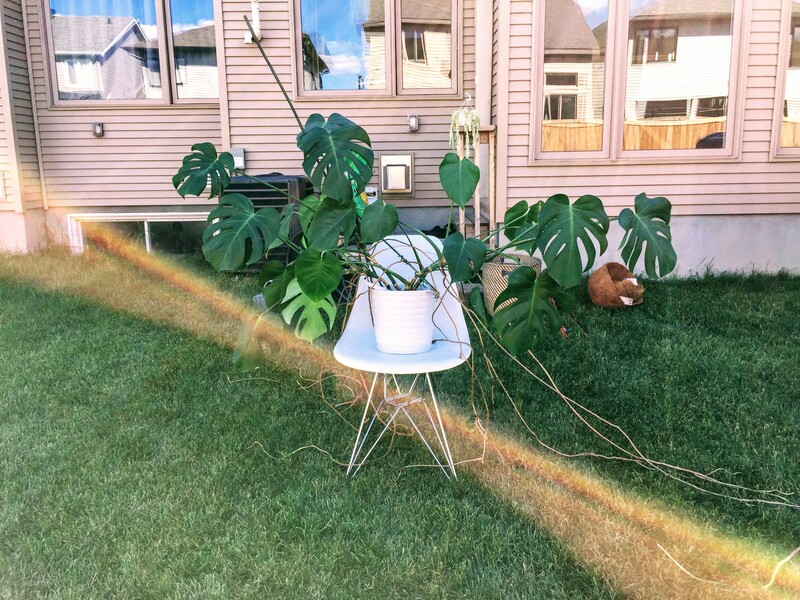 My monstera has grown a lot since this post and it’s probably time for me to elongate the stake for more support. All the best. How do you encourage aerial root growth? 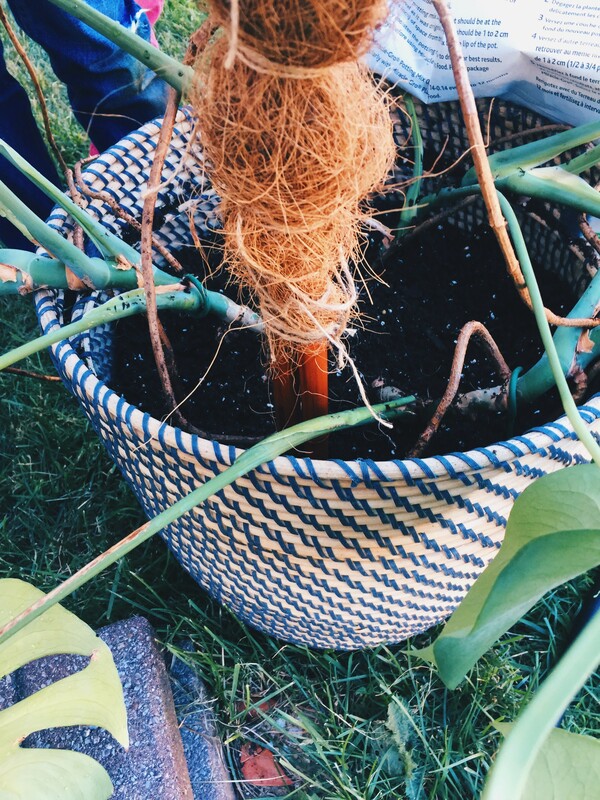 I have my monstera in a coconut fiber hanging basket…and it is not producing any long roots. Any ideas? 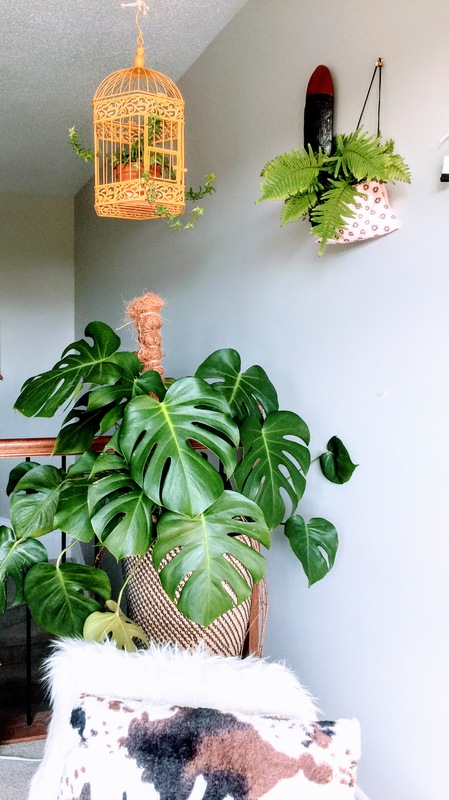 My Monstera Deliciosa is too big for my house and I’m considering donated it to a high school agricultural greenhouse in Maryland, or making and attaching a trellis to a wall in home (10ft ceiling) but don’t know if that would work. This is a photo from two years ago. I have other giant plants that are too huge for home and don’t know what to do with them. I’ve already propagated and divided for five away, but it’s hard to find people good with plants. Hi Barbara! Thanks for your useful post. I just bought my first monstera. It’s small one with just 3 leaf stalks at the moment. Looks happy . Should I insert the bamboo stick in now or a proper coir one like what you did so i don’t damage the roots later? Hi Barbara! You’re monstera is amazing! I was just wondering how much of the coir you needed, if you knew it weight? I can only find what seems to be far too much, 950g. Thanks! Unfortunately I don’t have that info. I used some lose coir I got for free and also cut up some from the coir basket. I would say buy a small batch(950gndoes sound like a lot) and go from there. If you look at the picture of the coir I used, I used all the loose coir plus a little bit of from the coir liner. All the best! Great post. This is exactly the info I am looking for. 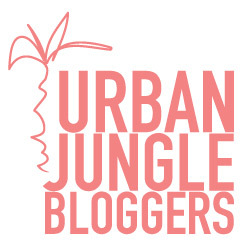 Will attempt to tame my monstera using these helpful tips. Thanks! Hi! Thanks for your informative post! 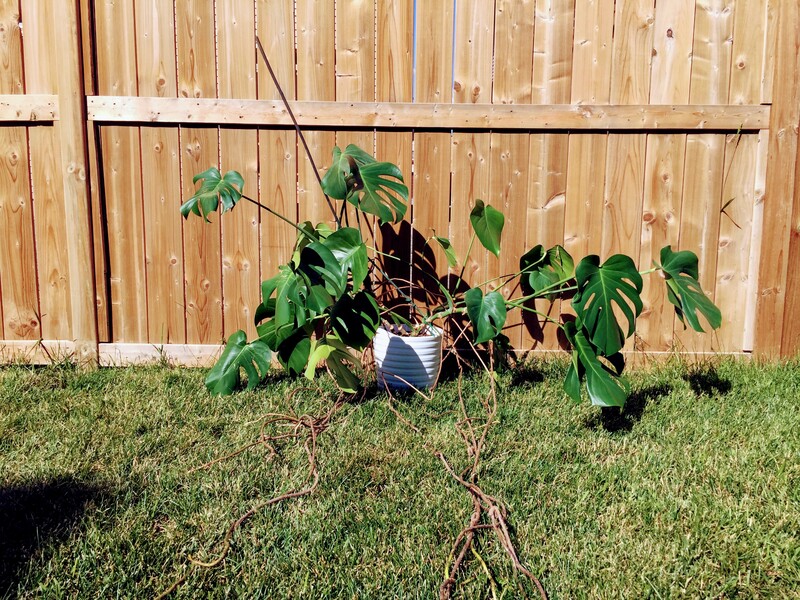 My monstera is a little over a year old, it is doing great, it is just growing down-wards because the need for a pole. can I inset the stake without repotting the plant? Thanks for your help! Glad to hear your monsters is thriving. You could put a stake in the pot but a) it would likely be difficult to push it all the way through (therefore not getting any good support) and b) you could damage its root. You don’t have to pot in a bigger pot if you don’t have one but removing the plant out first is easier. All the best! Anyone else have a suggestion? Thanks for this! I’ve got a Monstera that is growing outwards and I’m going to have to stake it. It’s still quite small – 5 or 6 big leaves – so I might be able to get away with a bamboo stick for now? Will bookmark this post for the future though! Hey! 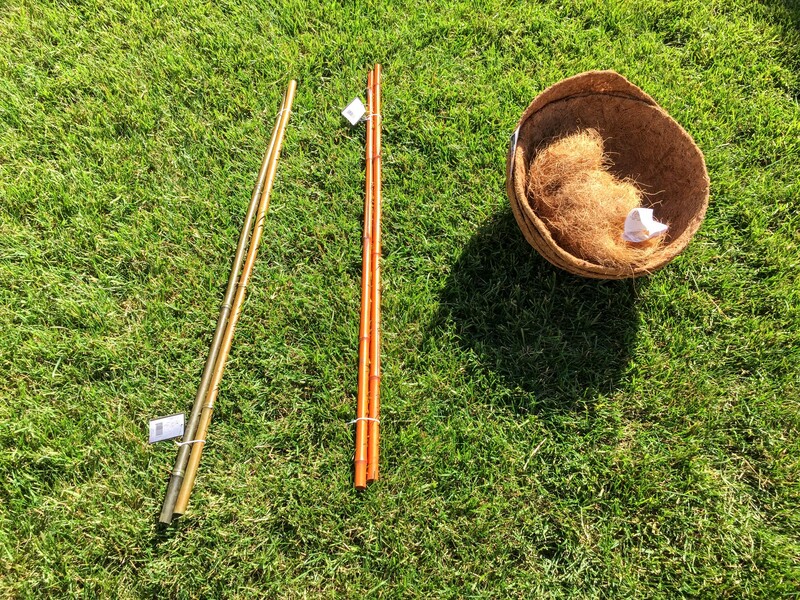 How did you connect the stems to the bamboo shaft? Did you use twine and just tie them? Also, does this plan need to be rotated every month or so? Mine seems to be bending toward the light. Thank you! HI Savannah. Yes to both questions. I used twine to hold the stems to the bamboo stake. And also you can choose to rotate the plant as you like as the leaves will grow towards the light. I just tend to rotate once in a while so I can enjoy the “frontal part” of the plant if you will. You Monstera is lovely. Thanks for sharing this. I’ll have to attempt it.